26.2 Quest: 13.1 Marathon Atlanta Race Report - A New PR! 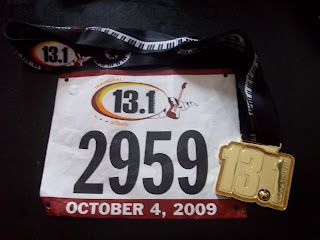 The Inaugural 13.1 Marathon Atlanta is now officially in the record books.... including mine! Race preparations started on Saturday with me trying to eat right and drinking lots of fluids. I tried all day but didn't really get the eating right till dinner time when my wife made me a grilled chicken/pasta dish from scratch. We really didn't plan all that well but she still came through with a winning combination... as always! I finished the evening out with a small whole wheat bagel with crunchy peanut butter, one of my favorite bedtime snacks. As evening hastened I decided I would get everything laid out and ready so I wouldn't have to deal with it in the morning.... the morning would come too early the way it was. I decided what I would wear (sorry ladies.... wasn't too difficult for me) and attached my bib to the shirt. I laid out the rest of the cloths, socks, and shoes with the chip attached, as well as my fully charged MyTach GPS watch, cell phone with arm band, ID, sport beans, and a little bit of cash. I also went ahead and set the bagels out so I wouldn't forget to eat in the morning as I rushed around. anticipation, and nervousness. I got dressed, applied some Aquaphor Healing Ointment that I was given some time ago to all the right places to try and keep the chafing away..... I didn't want to have the unpleasant color change to my shirt like I did in my first Half Marathon. My neighbors met me shortly after 5:00 am for the trip to Atlanta. As you can imagine at 5:00 am on Sunday morning the trip was quick and easy. We arrived at a Marta station about 1 mile from the start/finish line and used the mile to warm up the legs a bit before the race. We arrived in plenty of time and had some time to wander around and get a warm-up run in. The weather was wonderful, it was a little humid and 53 degrees. 7:13...er 14...er 15! came and the race was off. It took me around 20 seconds to cross the starting line. We were on our way and it felt great! we made a turn out on to the main road (Peachtree) and looped back. This is when we saw just how many people were running the race (close to 3,000) We were running past the starting line, but just on the other side of the fence. As we neared our first turn, just a short couple hundred yards we saw a runner go down in front of us. This brings back some bad memories for me. It wasn't too long after this that I left my neighbor and started running my own race. After a couple miles I looked down at my pace and I was running quite a bit faster than I had planned with a first mile just over 8 min and the second mile around 7:45. I felt good and was getting into my groove so I decided I would run based on how I felt and not worry about the pace unless I started to notice too much of a swing either way. We ran a loop through a couple neighborhoods and past a golf course. There were some really nice homes and some young families out to cheer us on. We had some hills that were challenging in this part of the race, but nothing like we were going to see later. It wasn't too long before we were back out onto Peachtree to head to the second loop a few miles up the road. We came past the starting line at about 5 1/2 miles with the best part still to come! This was the point we started seeing a few more of the promised bands playing along side of the road. We were coming up on the 10k mark and I noted based on the clock at the 6 mile mark and what my watch said that I had run the first 10k at a sub 50 pace (a good Peachtree Qualifier for those familiar with the Peachtree Road Race) and I still had more than half way to go. The half way point came and to my surprise they had a mat to read the chips (my time 51:50). I have never seen this before. I looked at my pace and I was running about 7.5 mph. 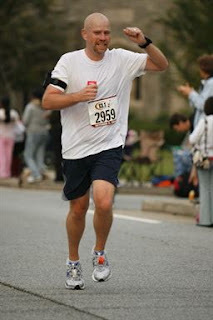 I was still feeling good so I kept running at the pace I had for the first half. The second loop took us through a couple more neighborhoods with bigger and more hills. It was getting tougher to keep the pace I was running, but still not so much that I was breathing too heavily. I was waiting for the 9th mile because according to the elevation chart the biggest hill was in mile 9. I knew once we passed that the worst hills would be over. Once we passed through the neighborhoods they funneled us off into a park where we ran the sidewalk trail through a wooded area and around a couple soccer fields. It wasn't too long till we were leaving the park with the welcome sign that said "only a 5k left!" Before too long we were back on Peachtree and in the home stretch. Just around 2 miles left and I was ready to die. I wanted so badly to give in and walk for a little bit, but based on my pace and the current time I knew I had a chance to break 1:45 and I would never forgive myself for coming so close and not making it. The final 1 mile was coming up and I was able to pull past one more lady that I had been following for the past mile. We came back to the starting point and to our delight we had to run down a long hill and then finish on an uphill. 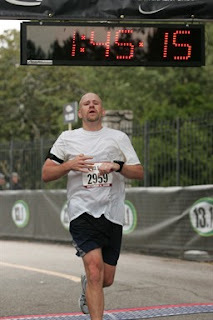 I was coming up the hill approaching the finish and knew it would be really close to the sub 1:45 I was now hoping for. As I got nearer I could see the official clock time as it ticked over to 1:45.
and 15 as I crossed the finish line! I stopped my watch as I crossed the timing mat and looked down at my watch to see 1:44:53.... I HAD DID IT!!!!! For a brief second I felt dizzy but quickly gained composure as I grabbed my medal, water, and a banana. They had a lot of food in the finish shoot, but I couldn't hold any more. I walked out and started to cool off and enjoy the moment as I refueled. I went back to get a bagel and a little later they had a BBQ sandwich for the finishers. I was a little irritated because they had no other water or Gatorade other than what was in the finish shoot. We hung around a little bit and got our official chip time and rankings. According to the stats I officially finished in 1:44:53 - Officially Sub 1:45! An 8:01 pace! These splits are based on my MyTach GPS watch but it seemed to beep just before every mile marker and got a little further each time. It showed the course was 13.2. I am not 100% on the accuracy considering that. Not sure why, it always seems to be really consistent any other time. There are not yet any pictures available, but once there are I will update the post with a few pics. I took Monday off, my legs were still hurting quite a bit, but Tuesday I went out for a 5 miler. I plan on getting up bright and early for a 10 miler tomorrow..... if I can drag myself out of bed after staying up too late to finish this race report. Onward on my Quest to a Marathon.... the 26.2 Quest! Congratulations! Awesome job, Tim! I'm impressed! Do you think your long runs were the key to your big time improvement? Congrats, well done. You have to be proud. Those are some great looking splits too! 1:44 on your 2nd half-marathon is superb timing. Congratulations! Am running the Chicago full this Sunday (10/11). Which marathon are you running? Your blog is good. Keep it up. That is an insane time!! Good job! Ravi - I am running the Chickamauga I think I have a link to it in my previous post, if not it is listed on the side bar. Good luck with Chicago on Sunday! Congrats! Its awesome that you killed your original sub 1:50 goal by an impressive 5 minutes. Hey Tim! congratulation for that amazing race, you did an excellent job and an awesome time, I'm gonna ask some advices for my son, he likes to run long distances but when he comes home he said "mom i think i need a massage" what do you think about? it will be good for him if I get him a good atlanta massage spa or something like that, by the way, what do you do when you finish a race? Congratulations on your second half marathon and attaining your desired time. 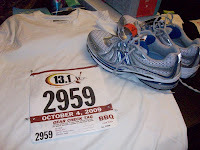 I have yet to run a marathon, but I hope I will be fit enough to run one soon. That's a fantastic time! I'm really impressed! Tim - thnks for the well wishes! Appreciate them! A continue moving frward. A month will be here a lot quicker than you may want it to be. Awesome job man! I hope to just break 2 hours in the HM next Sat in Charlotte, NC..
Barbie - thanks for stopping by. I have been following your running especially since you have moved to Atlanta. You will love this race. I will be doing it again this year as well...... But may not be "racing" it because of my recient issue with my calf. Well done. I used to do a lot of distance running yaers ago but then four kids came alone ( not all at once thankfully) I'd love to get back into it but its the time factor really.